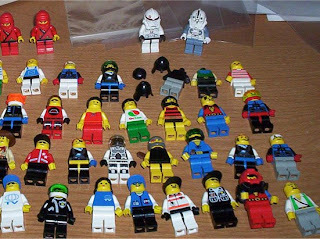 I used to have fun customizing LEGO minifigs. Most of them didn't turn out so well (especially the lineup of Cenobites from the Hellraiser movies that I attempted). I still have the Darth Sidious one that I made not long after Star Wars Episode I came out: it's in storage somewhere but it looks pretty cool, right down to that scowl on the part of his face that's visible. 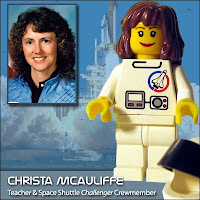 None of my customs were anything as good as this guy's work, which includes minifigs based on historical figures such as the Beatles, Fidel Castro and Christa McAuliffe (shown at left). Those with a religious inclination should check out The Brick Testament: Brendan Powell Smith's popular effort at rendering the entire Bible in LEGO (I can't wait to see how he depicts the Book of Revelation). People who prefer their LEGO creations to be more action-oriented need to stop by BrickArms: a fella who makes highly detailed weaponry for LEGO minifigs, including AK-47s and Uzi submachine guns.